Advertisements or Commercials through various medium is an important tool for any product promotion. It gives a perfect chance to inform the target customers about products features and its benefits. I got a chance to go through ‘ACG Ad Strategy Analysis’, which is a study on current advertising strategy of all verticals of automobile industry citing parameters like sales, brands, customer perception, product life cycle, budget, product position, competitive landscape etc. for various countries like India, China, Europe, Latin America and NAFTA and Middle East. 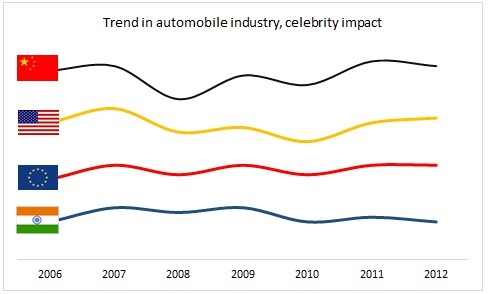 This article is a snapshot from the report which address the area of celebrity involvement in automobile branding and its impact on end customer and sales. To make a successful advertisement campaign, it is extremely important for the Ad agency associated to understand the connections between the brand, product, business objective and the end user. The parameters drawn in the table below helps in planning an effective ad-campaign. The most important factors that have to be considered in an advertisement is the benefits it brings to the brand as well as customer. In India, Bollywood actors and Cricket players are often preferred to promote brands, considering their big fan base as the main motivating factor. Let us now analyse a few celebrity advertisements & their impact on the end user & sales. Shahrukh Khan is the brand ambassador of Hyundai i10 in India since some time. Their latest campaign starts off with an attempt to capitalize King Khan’s massive fan base. The campaign kicks off with inviting the viewers to participate in creating the script for the next Hyundai i10 Ad. Ultimately a winner has been selected. Somehow things didn't work out as planned for the car-makers. Overall the commercial lacked depth and failed to send any clear message to end customer. Any indication on the i10's features or qualities were completely absent. The comparison between Sharukh Khan and father raise some eyebrows. In a country like India, from the cultural and traditional point of view, for every child his father is a hero. The commercial left no impact on the end customer. The year saw Hyundai i10 received a fall in sales which came down from 123,667 units the previous fiscal year to 92,897 units in FY 2012-13. Market share also came from 14.5% to 11.67%. The failures from the Joint Venture with Mahindra & Mahindra prompted Nissan to view the Indian market with a localized lens which can show them different colors of market potentials. In an attempt to tap the potential of small car segment, Nissan India launched Micra which tip them against the Hyundai and Maruti dominated segment. Together with Renault, they developed a strategy to deliver five new models by 2013. This also includes Duster which is enjoying a fair success in its segment. Ranbir Kapoor is the brand ambassador of Micra. There has been a series of commercials with the upcoming actor who has a strong fan base among the youngsters. Each commercial failed to send any message to the end customer. Nissan Micra's sales has been down by 38%, 18,633 units to 11,449 units. It also lost market share from 2.2% to 1.4%. On the contrary, Nissan Sunny has been promoted by without any celebrity. The pronunciation of “CAAR” in its ad has successfully left an impression that it is very spacious and full of comfort. The CAAR has been well accepted by the customers for features like price, space and comfort; they had gained around 5% market share compare to FY 2011-12. Yes it’s not CAR, it is a CAAAR. Jimmy Shergil has promoted Verito as a Brand Ambassador. Their two commercials launched had nothing to do with a car in general. According to the ACG report, the commercials were confusing that the urban population were unable to make anything out of it. The connection between product and script is absent. It neither says anything about feature, comfort or technology. The viewers are left confused as to what this commercial is exactly about. Sales have not “Grown With the New Verito” rather it fell from 17,839 units to 15,344 units in FY 2012-13 , also resulting in a substantial loss of market share from 9.5% to 6.8%, loss of 2.7% in FY 2012-13. This segment is dominated by Maruti Dzire with 169,571 units in FY 2012-13. Other players are Accent and Etios. Toyota Etios had an almost perfect commercial launch. When you have the Oscar Winner AR Rahman as a brand ambassador, you can’t ask for more. The commercial saw huge success in conveying a crystal clear message on its features like elegant design and the driving comfort. And just on the basis of this commercial, Etios was overbooked even before its commercial launch and remained that way for over a year. In my opinion the ad was trying to convince that driving Etios is pleasant like listening to your favorite music. The ad definitely did well to showcase the features of Etios and its driving comfort and most importantly succeed in conveying the message clearly and capitalize AR Rahman’s influence on the mass market. But sales declined an year after. In FY 2011-12 it sold around 50,157 units with 26.8% market share but in 2012-13 it could sold only 38,655 units with 17.1% market share, losses of 9.7% market share. Toyota launched Liva to capture market share in burgeoning hatchback segment. Virat Kohli is the Brand Ambassador of Liva. But the commercial used to promote Liva turned out to be a damp squib. Viewers are left confused listening to “This is not Virat’s Liva”. Added to this, the commercial does not make the advantage of this car or features the focal point of the entire ad. The ICC Player of the Year 2012, doesn't come cheap. So a huge investment is wasted. Liva couldn't make any impact on its segment. In FY 2011-12 it could sold 31,761 units, but in FY 2012-13 sales are decreased to 27,596 units. BMW was the market leader in India in Luxury Car segment. The ‘Little Master’ Sachin Tendulkar was the Brand Ambassador of BMW India. There were no commercials with Sachin in electronic media. But a connection between BMW, Sachin Tendulkar and the target buyers are completely missing. Eventually left no influence on the customers of luxury car segment. In FY 2012-13, BMW had lost their pole position to Audi. Abhishek Bacchan is a Brand Ambassador of Audi cars India and not many people know about this or no commercials were built around him. Aamir Khan was the Brand Ambassador of Mahindra Stallio. Different approach was used in the commercials which really went well with Aamir Khan’s star image. The commercials pit stallio model against the usual macho man bike stunts and talks about safe driving. However the story of Stallio is plagued by poor product planning. The product has now disappeared from the market completely. Wonder if Mahindra will ponder to ever enter the motor bike segment in India again. Well, in John Abraham, Yamaha got a perfect partner to go ahead with the usual stunt mania motor bike advertisement. One may wonder why every Motor Bike commercial is nothing but an adventure sport. I guess the time has come for manufacturers to indulge in some traffic awareness measures. Drive safe, live long. I assume Dhoni and Kohli are two well followed Cricket players in India. Dhoni’s bike craze is no secret to public. For that reason combined with the support he receive from all sections of people, he is the perfect partner to influence the bike lovers. But somehow the commercials keep coming with stereotype macho man stunts. In one of the commercials Dhoni even carried the whole cricket team to the match field. Kohli also appeared in some TVS commercials, but none the less , all look just wayward. In a time where sales figures were stuttering and were threatened by the entrance of foreign OEMs, Tata motors optioned for electronic ad-campaigns. The commercial featured Farhan Akhtar's voice and is a very expensive one in terms of production values. The commercial had everything in it which delivers a clear message to the customers. Even though the message is clear , the connection between Farhan Akthar, Tata's brand image and the end customers is evidently absent. I also believe Tata Motors need not run commercials on TV since the brand awareness in the mass market is pretty solid. It would have been very useful if the money had been used for R&D or to provide value added services for end customers. A better assessment methodology of the customers could have helped TML to achieve impressive returns. Meanwhile Farhan Akhtar received double digits in lakhs from Tata Motors just for the voice-over which is said to be donated to charity. Dhoni must be one of the most expensive celebrity. Ashok Leyland made him the brand ambassador. One has to note that Chennai is like a second home to Dhoni. Somehow the ad campaigns never had the beauty of Dhoni’s helicopter shot. I eventually asked many truck drivers and fleet owners to figure out what they think about this commercial. Nobody understood what they meant by this. So probably i had asked the question to wrong persons, should have asked this to the script writer himself. Bottom line is the failure in conveying the message to the customers. And a good waste of investment in tiring times for the Commercial Vehicle Industry. It has been a while since Force Trump started its struggle in its segment in the market. Even Salman Khan’s Dabangg couldn’t rescue Force Trump. One should say the concept wasn’t pretty bad, but the execution was miserable. The commercial was pretty fast so the message became unclear to the end customers. MAN's connection with football is well known in Germany. They are the official team bus of many famous German Football Clubs. This connection led them to do a series of commercials with Oliver Kahn dated from 2011. Together with the German stand-up comedian Oliver Poacher they released a series of commercials to highlight the features of their products. Somehow I found all of them comical. But the commercial had tried to conveying some message through texts like “MAN kann (MAN can)" and MAN schafts bus (MAN delivers). Eventually even after running ad campaigns with one of the most expensive celebrity who even hold the copyright of his own name, MAN sales remains flat. US is supposed to have a strong culture of using celebrities to promote products. 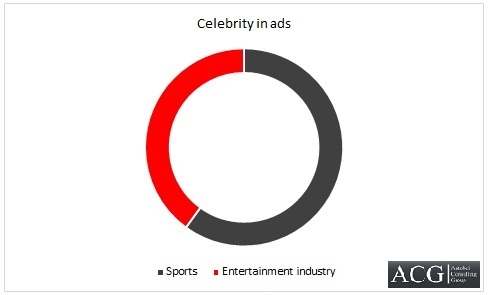 While in Europe you may see a trend of increased involvement of sports personals than actors or singers. As evident form the above case studies, It is nothing but an expensive affair when it comes to sign a Celebrity as the brand ambassador and run commercials. We have seen this trend increasing in recent years, with more and more Bollywood stars and Cricket Players often used to promote brands. Better results can be achieved through commercials with the type of money being wastefully spend. OEMs and Ad Agencies should do a good research and must decide the message to be sent to the target segment and how this message can be effectively left a mark on the customers. Followed by both OEMs and Ad agencies should do impact-analysis. OEMs and Ad Agencies should know how to calculate ROI under various complex parameters. Presentation is good. Wants to share few thoughts. a) an advertising is brand building exercise. Can expect result in the long run only. b) Presently, Indian automarket is static and e/one is postponing their investments due to various reasons. etc. Thanks for the comment Mr.Vengatesan, and glad to know we are on the same boat. Indian buyer today is so much informed about the product that he doesnt need any celebrity to tell him what he should buy, especially when it comes to automobiles. Advertisements probably affects the FMCG industry, automobile industry is totally product driven. A manufacturer may clock few pre launch numbers through advertisement but ultimately its the product USP that sells rather than MS Dhoni or SRK. A better bet would be to invest the money in product improvement / betterment / cost reduction rather than giving crores of rupees to the already cash rich celebrities. And ultimately you and me are paying for these Celebrity Commercials ! Price, and comfort to name the few.. Perhaps one responsible is trying to play it safe by looking for a celebrity since competition has got another in their ads. If the product does not do well nobody would like to be held responsible and be told that such simple things were overlooked. Buying decisions are surely influenced by Stars when one is buying creams and cold drinks etc. but for buying decisions for Cars in majority of cases the wise sense prevails. A very nicely compiled co-relation between sales and celebrity endorsements. The only drawback seen here is the Market Conditions , as seen in cars which has reduced by ~8% which will distort the real picture. First time that the Car industry in India has seen a decline in sales. Todays customer is more intelligent and does all comparisons since a lot is available on Internet. If the vehicle is Quality (in style, performance and Life ) customers keep coming and sale volume increase (Eg Alto,swift,Bolero Activa) I don’t remember any ad for these models (Alto 22000/Swift 15000/Bolero/11000 per Month). Agencies who made these ads mentioned in the article (I wonder which College they went to). This is just another waste and add some money to the price of the vehicle. Well saying this I am not against any Ads by celebrities but I understand that they don’t use ;;how the people will use. So device your product characters rather wasting money on celebrities. If I made any wrong statements pls consider it as my ignorance.. Adding some bits Well I like the ads by Volkswagen in many ways they caught my eye many times though I never used any of their vehicle. The article is good, but one counterpoint….had the auto industry conditions good, like we had in 2009 and 10, then how will you corelate the ads impact with the sales? it would have been good, correct? So by saying that because of ads the sales did not pick up….is incorrect. There are many factors for sales drop, apart from the industry trend. Even in falling industry some products (like Duster/bolero) have performed well. This is solely due to the product performance on all the 4Ps. So it actually becomes a difficult proposition for a marketeer to determine the impact of a celebrity ad on its sales. However, ads with clear message, irrespective of the presence of celebrity, are likely to do good ie create an awareness and message in the minds of prospective buyers. Product performance has to augment this, else a very good ad with a clear message will not lift the sales. People relate with celebrities and recognize them, because of which they are expected to stay on with the ad duration (which gives marketeer the time to convey his message) so marketeers use these celebrities. I think you haven’t understood the points we explained in the article. Answers to your counterpoints are already in the article itself. I agree with piyush…wasting funds on celebrities is other part…which would be a conscious decision of advertiser. But relating the same with YOY sales drop will not be relevent enough as it depends upon many other factors. After all, advertisements are made to inform, persude and remind consumers. I think this work can definitely become easier by deputing personal brands like Shahrukh khan, Sachin Tendulkar and other listed. Tremendous issues here. I’m very satisfied to peer your article. Thank you a lot. Nice replies in return of this question with firm arguments and telling all about that. Good Research,although would like to stress the point that Sales of product is combination of many parameters such as Marketing Endorsement,Product features,Market potential,Total Market Size,Purchasing Power,etc..
As rightly mentioned by Philip Kotler in Marketing Management,Product marketing is all about 4Ps i.e. Product,Price,Place and Promotion. Schumacher couldn’t make an Impact on the sales !!!! I think this website contains some really great info for everyone.